Here in Chicago, we have been hit hard with tons (and tons) of snow and brutally cold temperatures. With highs averaging around negative 10 this week (yes you heard me right, I said HIGHS) , we haven't had many options besides staying inside where it's warm and dry. 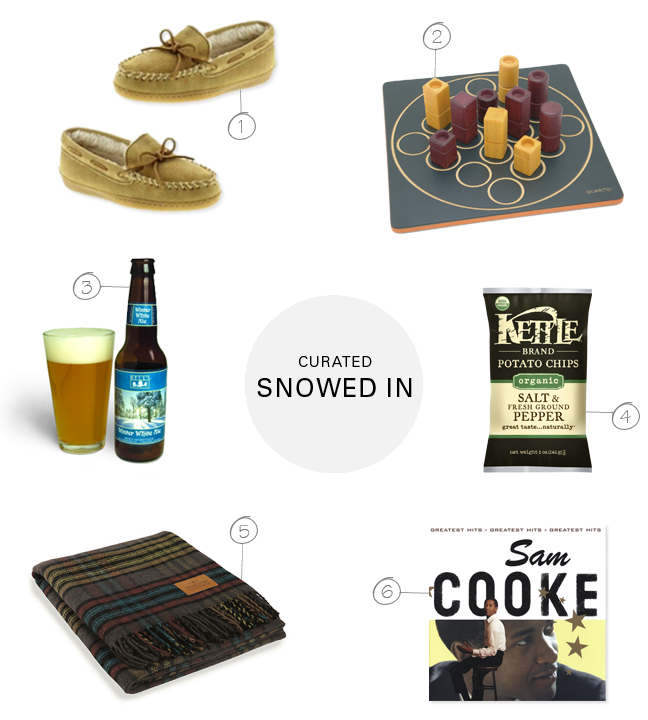 Today, for our very first CURATED feature, we are sharing a collection of must-haves for beating cabin fever and enjoying a cozy night snowed in. 1. Minnetonka Slippers: Slippers are essential indoor winter wear here in the midwest and this classic pair will keep your tootsies nice and toasty. // 2. Quarto: Turn off the tv and play a game! Quarto is a bit like a grown up super addictive version of tic tac toe. Plus the board and pieces are lovely enough to leave setting out all the time! // 3. Bell's Winter White: Drink up! We are big fans of seasonal beers and Bell's makes an amazing Winter White Ale. Check out the regional beers in your area. // 4. Kettle Potato Chips: Snacks and frigid winter nights go hand in hand. These potato chips are organic so you can (almost) feel good about munching on them! // 5. Pendleton Blanket: We're particularly obsessed with tartan this season. This super soft Pendleton blanket will stave off the cold and look so cool while doing it! // 6. Sam Cooke Greatest Hits: Put on a record and dance away the chills. This album is one of Claire's absolute favorites. I want all of these things right this minute! I'm off to find a place here in Chicago to buy games for my cozy Friday night in! Check out Marbles: The Brain Store in Lincoln Square. They have Quarto and a ton of other great games. Enjoy! It says that you're a F+M kind of girl!